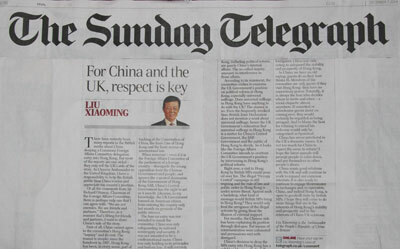 The Sunday Telegraph carries Ambassador Liu Xiaoming's article: "For China and the UK, respect is key"
There have recently been many reports in the British media about China denying a Commons Foreign Affairs Committee delegation entry into Hong Kong. But most of the reports are one-sided – they only tell the UK's side of the story. As Chinese Ambassador to the United Kingdom, I have a responsibility to help the British public hear China's voice and appreciate my country's position. Of all the comments from Sir Richard Ottaway, Chairman of the Foreign Affairs Committee, there is perhaps only one that I can agree with: "We are not enemies. We are friends and partners." Therefore, in a manner that's fitting for friends and partners, I want to share China's side of the story. First of all, China cannot agree to the committee's Hong Kong "inquiry" and its visit. The reason is simple: since the handover in 1997, Hong Kong has been, in every sense, part of China. Matters relating to Hong Kong, including political reform, are purely China's internal affairs. The so-called inquiry amounts to interference in those affairs. According to its statement, the committee wishes to examine the UK Government's position on political reform in Hong Kong, especially universal suffrage. Does universal suffrage in Hong Kong have anything to do with the UK? The answer is no. Even the frequently invoked Sino-British Joint Declaration does not mention a word about universal suffrage, hence the UK Government's reiteration that universal suffrage in Hong Kong is a matter for China's Central Government, the SAR Government and the public of Hong Kong to decide. So it looks like the Foreign Affairs Committee intends to overturn the UK Government's position by intervening in Hong Kong's political reform. Right now, a visit to Hong Kong by British MPs would pour oil over fire. The illegal "Occupy Central" campaign is still ongoing and the rule of law and public order in Hong Kong is under severe threat. Against such a backdrop, what kind of message would British MPs bring to Hong Kong? They would only feed the arrogance of the illegal activists by giving them the illusion of external support. For months, the Chinese side has been explaining its position through dialogue. But means of communication were exhausted and persuasions met with disregard. China's decision to deny the MPs entry into Hong Kong has a solid legal basis, with the full backing of the Constitution of China, the Basic Law of Hong Kong and the basic norms of international law. When someone – even if it is the Foreign Affairs Committee of the parliament of a foreign country – disregards the strong opposition from the Chinese Government and people, and ignores the repeated dissuasion of the Government of Hong Kong SAR, China's Central Government has the right to act as it sees fit. Likewise, to my knowledge, the UK Government banned an American citizen from entering the country only last month on grounds of the public interest. The ban on entry was not intended to insult the committee. China was only safeguarding its national sovereignty and security. It was not intended to be a confrontational move. China was only holding to its principles and bottom line. It will certainly not close Hong Kong to foreigners. China was only acting to safeguard the stability and prosperity of Hong Kong. In China, we have an old saying: guests do as their host thinks fit. Members of the committee are only guests if they visit Hong Kong: they have no supervisory power. Naturally, it is always the host who decides whom to invite and when – a social etiquette almost anywhere. If uninvited or unwelcome guests insist on coming over, they would certainly be regarded as being arrogant. And to blame the host for refusing to extend his welcome would only be categorised as hysterical. China has never interfered in the UK's domestic issues. It is not too much for China to expect the same in return? I hope the latest episode will prompt people to calm down, and put themselves in other people's shoes. China wants good relations with the UK and will continue to work to expand our common interests. It is also ready to continue to engage Westminster in exchanges and co-operation. China, and indeed Hong Kong, is open to goodwill visits by British MPs. I hope they will come to do more things that are in the interests of Hong Kong's stability and prosperity and in the interests of China-UK relations.